In the lead-up to today’s big Microsoft keynote event, it was strongly suspected that Cortana, the company’s voice assistant software, would be spreading its wings beyond the confines of Windows Phone and reaching a broader audience with the Windows 10 upgrade. Now, the software maker has confirmed this to be the case, and the much-lauded feature should serve as another enticement to those considering the eventual upgrade. Microsoft has already confirmed that Windows 10 will be a free upgrade for those on Windows 7, Windows 8.1 and Windows Phone 8.1 – at least for the first year of Windows 10’s existence – and with Cortana now set to be baked into the software, there’s another good reason for eligible consumers to snap Windows 10 up as soon as it emerges from the ether. Cortana may have arrived much later than competitors like Google Now and Apple’s Siri personal assistants, but the belated arrival did, in many respects, work to its advantage. For example, Microsoft could, and did, take the opportunity to learn from the strengths and weaknesses of Google Now and Siri, creating a digital assistant that essentially combined the best bits of both. With Cortana, we have a system that performs at a level way beyond its relatively young age, and the fact that Microsoft is ready to throw it into Windows 10 is a testament to its maturity. Given that Windows Phone only occupies a small segment of the smartphone market at present, the vast majority of consumers have yet to test out or interact with Cortana in any kind of capacity. But by including Cortana with Windows 10 from the get-go, it’ll soon become as familiar as the soon-to-return Start menu, and as per today’s demonstration by Microsoft’s Joe Belfiore, there’s much to be excited about. With features like auto-filling desktop searches and seeking to guess the info you require based on your general usage habits, it’s every bit a Google Now-incarnate, with a touch of Siri-esque personality thrown in for good measure. But Cortana’s feature-set isn’t completely unoriginal, and with the ability to compose emails using simple voice commands, it should go down rather well with those aiming to be as productive as possible. 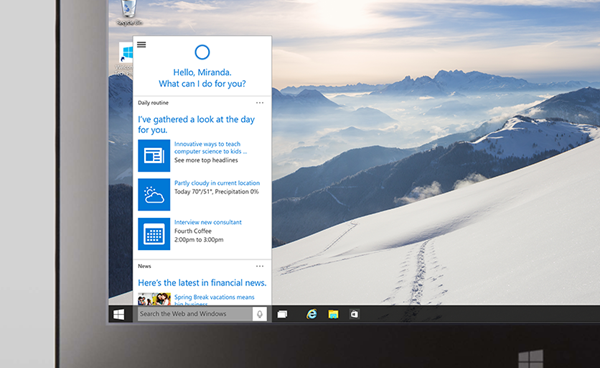 Are you looking forward to Cortana’s emergence with Windows 10? 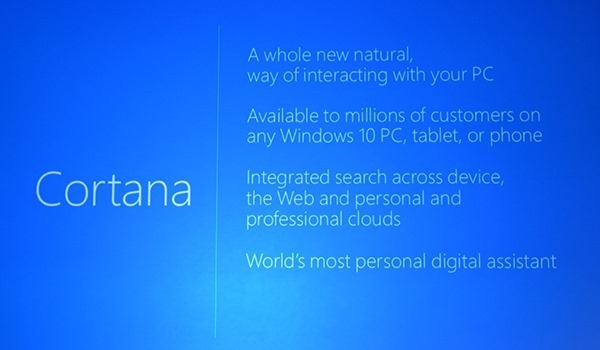 Windows 10 looks as bland and flat as 8 and iOS 7 and 8. The “return” of the Start Menu adds to the unattractive. The I use Siri once in a while with iOS 6.1.2. I prefer hands-on and rather than speaking to my devices. Windows XP and 7 have a Cool look and feel, just as Mavericks and before do. I won’t switch to Yosemite because Apple and MS are both going bland and boring for a new GUI look. Change is a great thing but to strip the bold and colorful away….?? How about bringing it BACK are focus on fixing bugs?? Either that or make XP, Windows 7 skins (themes) that cover all parts of the OS GUI including the “Retrurn” of the FUGLY Start Menu. Metro and Tiles, blllllleeeech!!! We WANT the BOLD colors back!! !